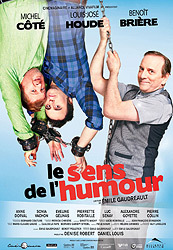 Luc Dubé and Marco Fortier are one of those not-so-funny attack comedy duos. It’s summer and they’re touring La belle provence playing small halls in any small town where they can book the room. Trouble is Luc just might be the worst funnyman in the world, seemingly incapable of getting a laugh even if his life depended on it. But his partner is the exact opposite even if all of his material might be most politely described as stale. Like many more famous stand-up comedians before him – Don Rickles comes to mind – Marco relies almost entirely on baiting the weakest guy in the room. But their little tour through the peaceful landscape hits a major bump in the road when they stop in Anse au Pic in Québec’s beautiful Saguenay region, where they make the terrible mistake of turning their focus on one seemingly powerless Roger Gendron (Michel Côté). The fun stuff begins when Luc and Marco (and the audience) learn that Roger is not so meek and mild. He is, in fact, a whole stranger than anyone knows and comes complete with serial-killer tendencies. The road trip is over and the tables are turned when Luc and Marco wake up chained inside Roger’s barn. Images courtesy of Alliance Vivafilm.